I discovered Fiverr.com a few weeks ago through an email from a fellow marketer. I thought the whole idea with Fiverr was pretty cool – you can take up people’s offers to do little things for $5 and you can offer to do things for others for $5 too – but I didn’t really see any use for it… until now! If you go to the main page you’ll see a whole lot fo random Fiver offers… for example “I will phone up anyone you want on their birthday and sing Happy Birthday to them Marilyn Monroe style for $5” which doesn’t really appeal to us marketers. But, dig a little deeper using their search function and you can uncover a goldmine of internet marketing related services being offered. Almost anything you can think of, you can find someone who will do it for $5. From creating sales videos, to spinning articles, to designing logos to submitting your websites to directories.. the list is endless. And you guessed it, every job will set you back just a tiny 5 bucks. Now don’t get me wrong, you’re not going to find someone who is going to write you a full-length sales letter or 50 page ebook for $5. But for smaller, tedious jobs that you don’t have time to do or don’t want to do yourself, Fiverr is the place to go to outsource. I found a couple of people to get backlinks and to turn an article into a video for me. There will be a couple of days turn around time – but if it wors out well I’ll definitely be using them again. I don’t think I have to tell you the benefits of outsourcing. There is only so much you can do on your own. Outsourcing lets you borrow an extra set of hands to get more done. If you’ve never outsourced before, Fiverr is the place to go and try it. Fiverr is not only an awesome place to outsource tasks, it’s also an awesome place to advertise your service and or products. Today I was looking for someone to make some stickers for a niche website I run, and found one guy offering 2 stickers for $5. When I went to see his offer, I ended up at his website (his URL was in his offer description) and am probably going to place an order for about $150! So for him to advertise a $5 deal got him a $150 order instead. 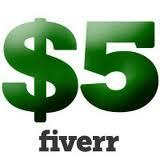 Fiverr is a great place to be creative with your offers and you need to be to stand out. Doing tasks for $5 is not going to make you rich, but the potential to get clients for bigger ticket services and prodcuts is definitely there. There are people selling digital downloads saying “I will sell you Instant Adsense Profits video course with Master Resell Rights for $5” which could be ok to get leads, but just like everywhere you advertise, you need a unique, irresistible offer to get people jumping on it. I can see Fiverr.com getting more and more popular in the future. Not too many people know about it now so this is a good chance to get your offer or ‘gig’ up there. p.s. Have you used Fiverr before? What was your experience? Good or bad? What did you outsource? What are you offering? Please leave a comment and share this post! GigWebsite .net is FREE to Post Jobs on and is seeking individuals to post micro job services they will do for $5 that might take a few minutes to do but is extremely valuable to others ($50 and $100 Price Points are ALSO AVAILABLE). Our site is a great way to earn extra money and it is always FREE to post. If you acquire a job, we simply charge a 10% selling fee which is cheaper than most. Please visit our site today and post all services separately you can do for $5. ie: type a 100 page transcript, Internet or Social Marketing, small art drawing, translate a full page, etc. Please be exact in the post: I will send you 1000 facebook likes for $5. Our press release will be going out soon and we hope you can be part of our exciting Micro Job venture. Kindest Regards, and we look forward to seeing your post soon. Hey, thanks for the ‘subtle’ little plug for your Gig website.. (sarcasm) but at least you went to the trouble of seeking out my blog and posting it. I can’t really see how it’s different from http://www.Fiverr.com though. Thanks for the useful tips about Fiverr. The power of micro entrepreneurship has evolved!!!! Hi Stu, Followed your last email to me to your site here and went to fiverr and placed an advert for my Google Places guide. Also answered a general seo question so maybe it will provide some leads for the local internet marketing services business. I will let you know. BTW how do you set up an rss feed?